Interested in selling your Used or Excess Cisco Aironet 1540 Series Outdoor Wireless Access Points? NetEquity.com is a leading trader of Cisco Aironet 1540 Series wireless access points. If you have recently completed a wireless network upgrade or turndown and have Cisco outdoor access points you want to liquidate, contact our buyer agents and request a quote. 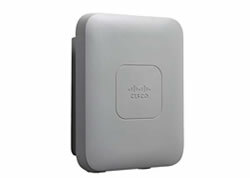 Cisco® Aironet 1540 Series outdoor access points offer the latest 802.11ac Wave 2 functions in a rugged, ultra-low-profile housing that service providers and enterprises can deploy easily. The Cisco Aironet 1540 Series is ideal for applications requiring rugged outdoor Wi-Fi coverage and supports the latest 802.11ac Wave 2 radio standard. Housed in a compact, aesthetically pleasing, easy-to-deploy package, the 1540 Series offers flexible deployment options for service providers and enterprise networks that need the fastest links possible for mobile outdoor clients (smartphones, tablets, and laptops) and wireless backhaul. The 1540 Series access points give network operators the flexibility to balance their desired wireless coverage with their need for easy deployment. Whether deployed as a traditional access point or a wireless mesh access point, the 1540 Series provides the throughput capacity needed for today’s bandwidth-hungry devices. NetEquity.com Buys and Sells Cisco Aironet 1540 Series Outdoor Wireless Networking Equipment. If you are an equipment seller or potential buyer interested in pricing, we can help! Contact us today for a quote. Are you looking to Buy New or Refurbished Cisco Aironet 1540 Series Outdoor wireless access points for a planned upgrade or other project? NetEquity.com has extensive inventory available at competitive discount prices on both New and Refurbished Cisco Aironet 1540 Wireless Access Points. Models we Buy and Sell include the popular AIR-AP1542I-B-K9 and AIR-AP1542D-B-K9 models. If your company is planning an upgrade from your current Cisco Aironet Outdoor wireless access points, contact us today for a trade-in quote on your old equipment. We also provide competitive pricing on New, Used and Refurbished Aironet 1540 Series Wireless Access Points. NetEquity Refurbished Cisco Aironet 1540 Series Outdoor Wireless Access Points are professionally remanufactured to Grade A Cosmetic Condition, fully tested by Certified Engineers and reset to Factory Default settings. Our Refurbished Cisco Aironet Wireless Access Points include Mounting Hardware and RJ45 patch cables, and are ready to install out of the box. In addition to offering extremely competitive pricing on Refurbished Cisco Aironet Outdoor Products, we also offer a full 1-Year replacement warranty for End Users on all Refurbished Cisco products. We also maintain a very large standing inventory of the most popular Cisco Aironet Outdoor Wireless models and accessories, ensuring that we have what you need IN STOCK, with no long lead times. NetEquity.com wants to buy your used, excess or end-of-life Cisco Aironet 1540 outdoor wireless access points. If you are interested in an upgrade from your current Cisco 1540 access points, contact us today to sell, consign or trade your unwanted Cisco Aironet 1540 Outdoor Wireless Series equipment.